When I was 12 my life changed forever. I know most people spend their lives searching for their soul mate, that person who just instinctively knows, knows everything before you speak, that person you can live happily ever with. I found mine when I was 12. Don’t get me wrong, I then went on to find the love of my life when I was 29. My soul mate, however, was sent to me in the form of Hayley Lynan (Gilson at the time), we met in Eastburn Park in the 90’s and we were awesome. We were just so super cool with our 90’s stuff. We had plans, like big humongous plans, rule the world type plans and generally being awesome. Unfortunately our lives ran away in opposite directions and our dreams were left, discarded in Eastburn. We drifted apart until the Universe decided it could no longer cope without us being side by side. Our awesomeness converged once more and our friendship became an unbreakable bond. We’ve been friends now for 22 years and we decided this needed celebrating. 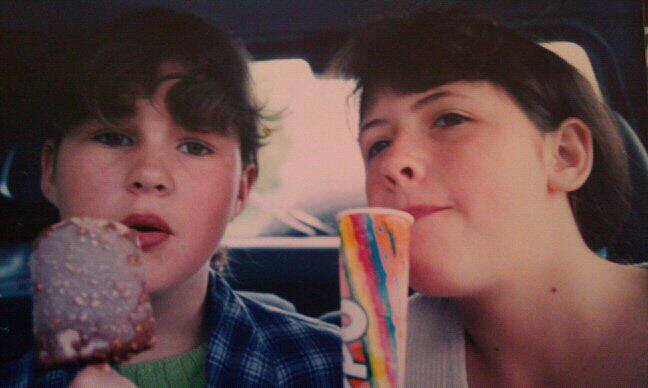 When we were 12 we went to Great Yarmouth with my Mum, nothing unusual there you might think. Apart from Hayley neglecting to inform her Mum that she was coming with us and failing to bring any clothes with her! We had to go find somewhere to buy her some underwear! Also this was in the days before a quick text message home. It was all okay in the end though, at least I think it was, I don’t really remember the reaction from Hayley’s Mum when we returned. Anyway, we thought the best way to celebrate our 22 years was with a trip back to Yarmouth. We booked ourselves three nights at the Haven caravan park, just the two of us and it was going to be as awesome as it was the first time round. We basically did nothing for three days, apart from eat lots of delicious cake! We wandered around, sat on the beach, explored, watched films, ate food, drank champagne and oh my word did we laugh. We are the funniest people in the world. Seriously, I can’t even get over how hilarious we are. We wandered around Great Yarmouth, eating fish and chips and doughnuts. Playing mini golf, enjoying the Ferris wheel and sitting in the sun. Hayley and I have this beautiful unique connection where we always know exactly what the other one is thinking and whatever those thoughts may be, nothing would shock us or give us reason to judge the other. That woman could murder someone and I’d be right beside her ready to help her hide the body. We are the complete opposite of each other, it’s ridiculous, we couldn’t be further apart on the scale of everything. Apart from awesomeness, we are equal in that respect. Hayley’s drinks for the night and my drinks for the night..
Hayley’s make-up and my ‘make-up’! I’d never stayed in a Haven holiday park before and this place did not disappoint. It’s incredible! There’s so much to do, we didn’t actually do any of the things on offer but the place was great anyway. They even have Papa John’s and a Burger King! Also if you want to know where we got that delicious looking cake from it was here… The Dragonfly Bakery.